"The Only 'Woodstock' I Remember..." Urban Camo Vietnam Vet Tribute Bowie Knife with Nylon Sheath | BUDK.com - Knives & Swords At The Lowest Prices! Where were you in 1969? Frolicking about, care-free, in the mud at Woodstock '69? Or fighting for those festival-flocking hippies' freedom in an equally muddy, but decidedly less cheerful setting - the brutal, soggy jungles of Vietnam? 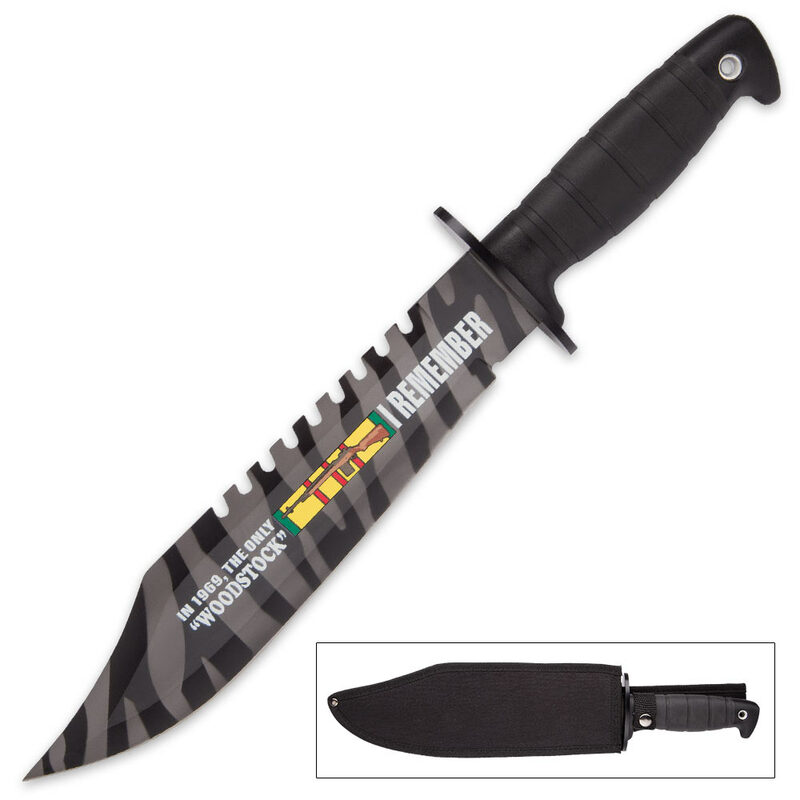 Vietnam vets, tell everyone where you were in the summer of love with this bold, rugged urban camo bowie! 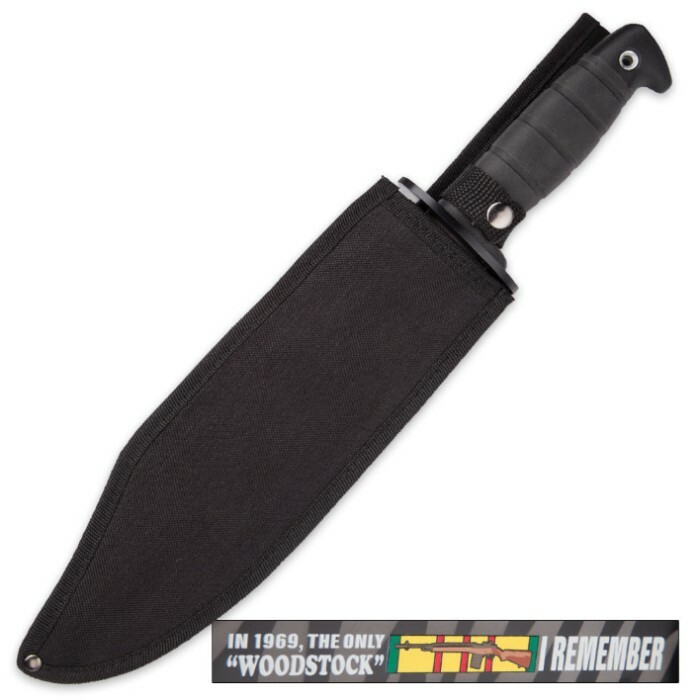 Amusing yet poignant, the stout, razor sharp clip point blade reads, "In 1969, the only 'Woodstock' I remember...," cleverly referring to the wooden stocks of Vietnam-era military rifles. 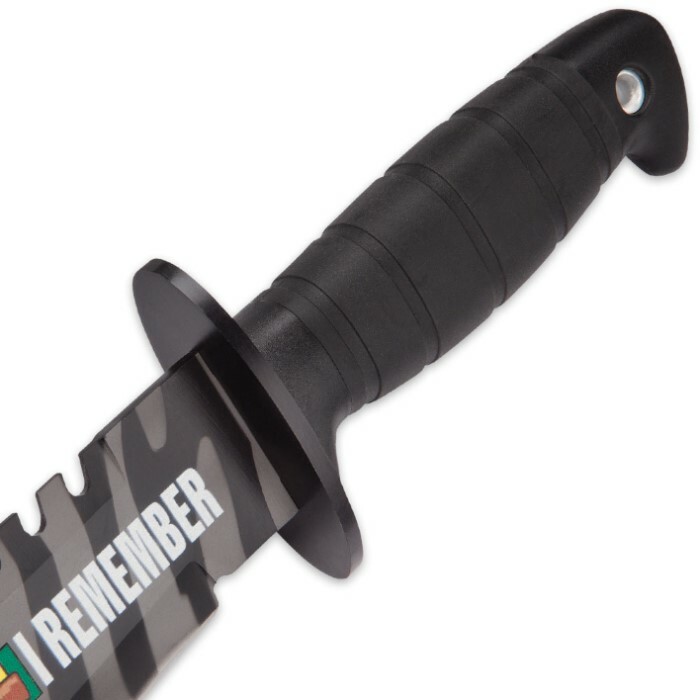 The text flanks a full-color image of one of these classic rifles, framed inside a vibrant rendering of the iconic green, red and yellow Vietnam War service ribbon. Though eye-catching and great for display in a military or cutlery collection, this unique bowie is robust and capable, as well - perfect for back country adventures, hunting, farm chores and all manner of vigorous real-world cutting jobs. The blade is rock-solid and powerful, forged from resilient 420 stainless steel and enhanced with a wicked sawback and a chic, zebra-esque urban camo finish. Equally tough, the polypropylene handle is contoured and rubberized for a comfortable, no-slip grip. From the field to the display case, this multitalented beast of a bowie outperforms fixed blades priced two and three times as high! With such an incredible value, it's painless to get two - one for yourself and one to gift to a proud, brave Vietnam veteran in your life.